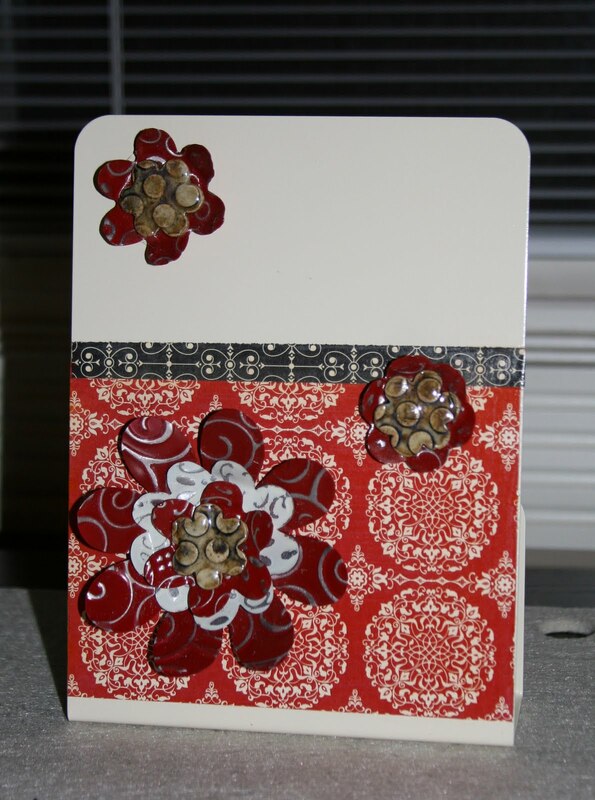 I am a lover of ALL things creative, be it nail art, card making, scrapbooking, or home decor. This is the place for my projects and inspiration. Have I ever told you that I am just a bit crazy? Add in saving money or free stuff and it pushes me over the edge. OVER THE EDGE. Well, all of you in the U.S. know that yesterday was an unofficial holiday here, for those of you not in the U.S. let me explain. Yesteday was Black Friday (named that way because this is the day that retailers move out of the "red" in their accounting books and into the "black") so this day signifies the day of the year that retails start making money. For me it signifies crazy sales, lines, waiting for hours in the cold for stores to open at insane hours & FUN! See I said I'm a bit crazy. We were at the In-laws for the Thanksgiving holiday in Jackson, MI. For me that equals less people shopping (smaller town) more deals for me! I promptly got in line for Best Buy rumor was that they would hand out tags starting 2 hours before they opened at 5am. My SIL headed to Kohls, opened at 3 am, She was in search of several items and I was in search of a Shark Steam Mop for all those tile and wood floors in my house. Then she ran to Target that opened at 4am, I was still in line, freezing. At this point I considered snuggling up to a stranger, for real, I was like well, I could rationalize this. However my choices were 3 men in camo (nothing wrong with camo) but a bit scruffy & one of them had their wife with or the 2 Motorcycle Gang Members behind me that happened to be carrying a concealed weapons, guns. So skip that. Score, for SIL at Target, so she ran to Toys r Us for me. I'm still in line. 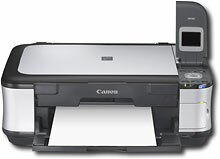 5am: We head into Best Buy for my wireless printer and labeler. Yep, I'm a nerd. By 5:30 we were back out the door and into the car. Quick run through Burger King for Breakfast, did I mention it was still dark out?!?! Onto Joann's Fabric: In search of Cricut cartage, fabric, and Sizzix dies for SIL. Wait in line for 10 min & scored a $5 gift card when we walked in because of an ad misprint. Bonus! Plus, we had a 20% off coupon that could be used on everything we bought. We scored a Cricut cartage for about $25 dollars and SIL scored some Sizzix dies for around $10, normally $45. 6:30am: Gymboree: 30% off the whole store, plus we have a 20% off coupon. Victoria's Secret: Buy One Bra, second 50% off (not to get to personal but I desperately needed new bras, desperately) Plus 10$ off coupon, free underwear coupon, plus free bag with products inside. Younkers/Elder Beerman: SIL scored some earring for $0.52 cents because of $10 off coupon. Bath & Body Works: Buy 3, get 3 free products, plus another free item, $10 coupon, plus I purchased the bag for $20 with over $120 worth of free items inside. Back to Joann's for fabric: Nonscore: The line was INSANE, we were number 68c and they were on 67b, we waited 20 min and they only moved 2 numbers. So we left. We were yelled at by a stranger for no reason, interesting. Big Lots: Nothing we needed. Michael's: Christmas Ribbon for 70% off. Swan Creek Candles: They have the BEST candles! To pick up some wax for my Stampin' Cousin. Toy House: Picked up 2 puzzles for Adventure Baby. Money Spent: Around $250, YIKES, money saved by shopping early and only buying things on sale plus free items, $700!!! Now that's what I like to see! And we were done by 11:30am!!! 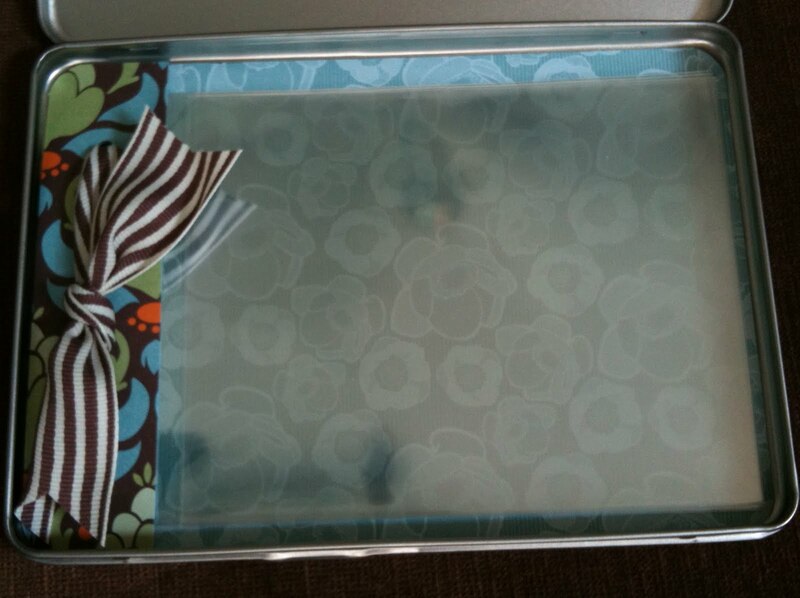 I am participating in Infarrantly Creative and Tatertots and Jello’s Blog Hop for a chance to win a Mint Cleaner. It is the revolutionary machine that cleans your hard floor surfaces for you. 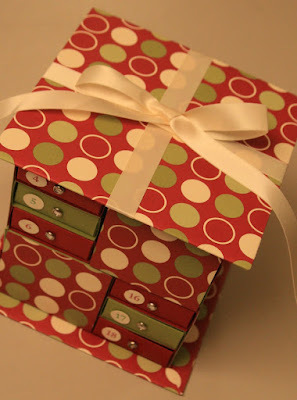 Click here to join the blog hop and a chance to win! Online Spectacular is here! 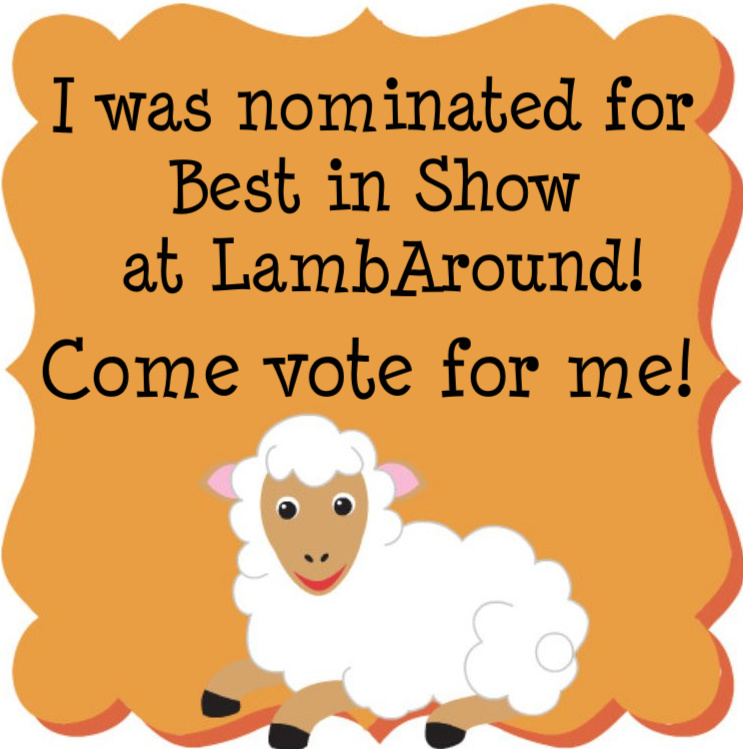 Only until the end of the week, so nows the time! Also, free shipping on orders over $150, remember a $150 order will entitle you to a level one hostess set and $15 in free products, plus now free shipping! Sorry for the strange listing here but I wanted you to see a list of the great deals, check out my website for a prettier version. The second price in the list is the sale price with the first price being the normal price. 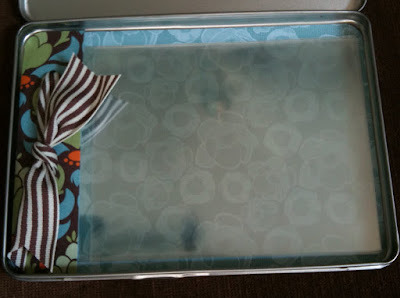 Contact me today to learn more or visit www.taraangus.stampinup.net to place your order. This is only around for NINE days! and vote for my Turkey Shirt. Thanks! I found this great idea on The Cottage Home a couple of weeks ago (click here for tutorial) and knew I had to make one for adventure baby! So here is my version. No comments on my sewing skills please though. For real this is the second thing I have EVER embroidered with my sewing machine. EVER! I do have to say it was super fun and I might have to make a different for for Christmas....maybe a Christmas Turkey, or not. Here's the whole shirt. Adventure baby was already asleep so, no real life picture yet. Sorry. 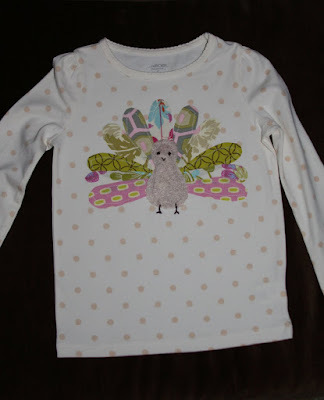 I picked up the shirt at Target for around $6 in the toddler section. Check out these beauties! I also purchased these at a Holiday Expo last weekend. Using the Leaves #2 die for the big shot metal was cut out. Then ran through an Embossing Folder. Next silver, gold, and copper leafing was applied. Lastly, Stampin' Up! glass glitter in Champagne was added for a bit of bling. Love these beauties. She did a great job! I HAD to buy it for my office! I have forgotten the lady's name that made it but I will add that later (I forgot to bring her business card home today). Oops. She simply took metal (another SU! 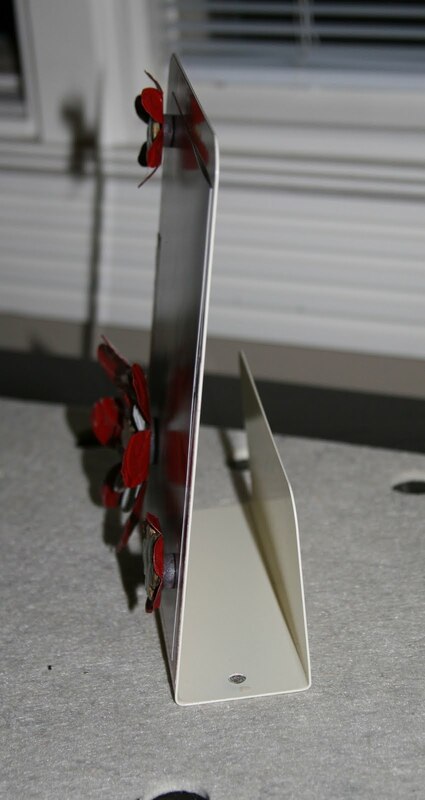 demo tells me metal flashing) ran it through the big shot using the flower folds die and other dies. Spray painted the metal, or maybe she sprayed the whole sheets first. 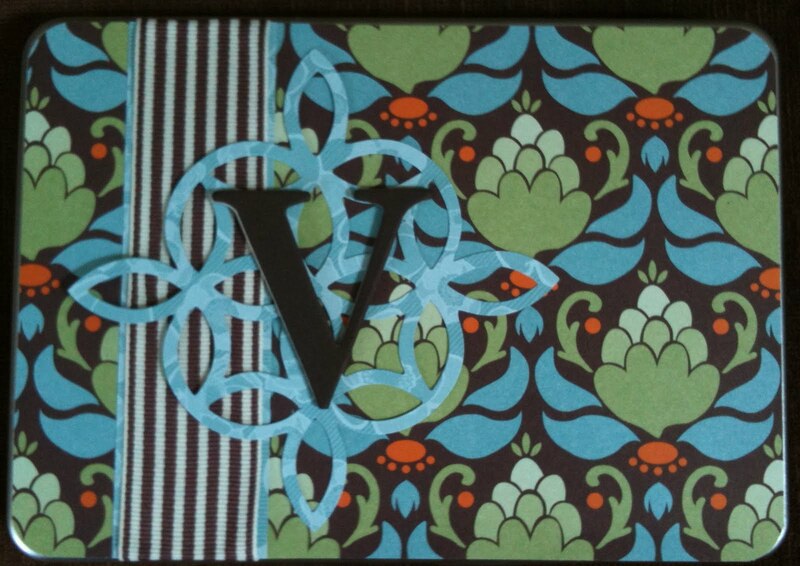 Then after it was cut out she used embossing folders and ran it back through the big shot. Next she sanded the "hills" in the metal to distress it. Attached with glue, add magnet, & viola. Side note: She makes the ceramic center piece herself. Here is the side view of the organizer. 50% off Starter Kit, For Real! 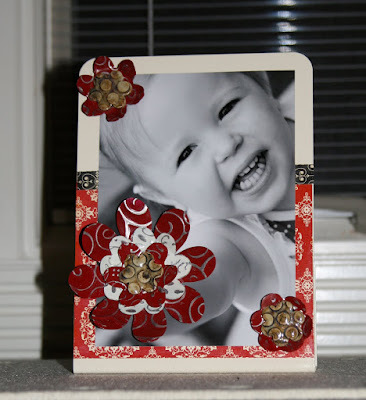 Do you love Stamping, Scrapbooking, Home Decor, or just crafting in general? Well, Stampin' Up! has announced a great promotion just in time for you. Join my Stampin' Family: Dream Big. Stamp Often for only $87.50! Not sure what to put on your Christmas list? How about an early Christmas gift....hint, hint. In total honesty my husband bought me my starter kit 8 years ago, almost exactly, and here I am today, still stamping like a crazy woman. BEST Christmas gift ever!!! Seriously. Stampin' Up! has taught me that I can be a business owner, use my creative skills to teach others, allow me some well deserved time out of the house, travel to fun places each year to stamp (both close and far), and MOST of all my hobby pays for itself! 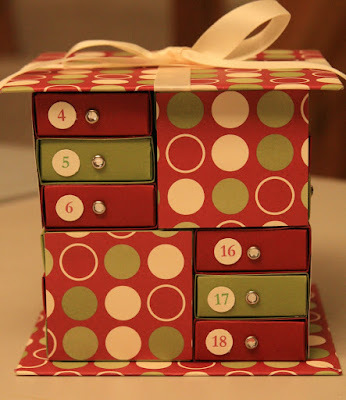 On Saturday December 4th at 10am I will be holding a Christmas Advent Matchbox Class. These are super cute advent calendars with a twist. The cost is $25 and includes a full pack of Christmas 12x12 paper. Please Choose Paper #1, #2, or #3 when signing up for this class. Please sign up by November 25th to ensure that I have your paper selection on hand. Thanks for understanding. When you sign up a paypal invoice will be sent to you for payment, or if you are in the area you can always drop payment off to me. 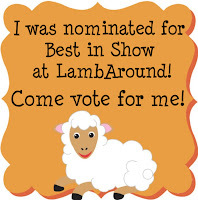 LOVE this idea but you don't live in the Grand Rapids, MI area or can't make it to the class? Sign up for a class to go kit! This will include everything you need to make this project plus instructions and will be shipped to you. Cost for the Advent CLASS TO GO is $35 (In order to cover the shipping costs for priority mail and an extra $5 for me to do all your cutting, punching, stamping). For about 6 months we have had this mirror hanging in our bathroom. Although it was a great find already painted in silver, not the ugly gold from the 70s, it just felt way to heavy for my light & airy bathroom. When I bought it I knew I would paint it but since it was in a decent condition as it was I committed myself to living with it for a while that way. Here is the before picture. You can see I already started to prime it, then remembered to quick take a couple of picture. I almost forgot in my excitement and rush! The day I did this it was supposed to rain and I was heading over to a friends to help her pick out some paint for her bathroom remodel. Here it is in all it's glory. I used American Accents (my fav spray paint) in Apple Green. I did do two coats + on this beauty after priming it really well. Oh, apparently one of my bathroom lights is out...hmm....DH is going to have to fix that one. Close up shot of my work. 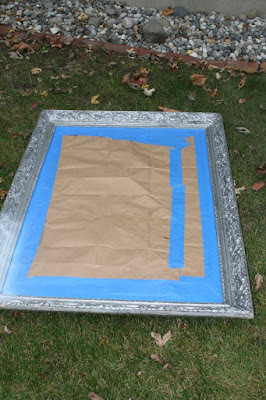 You can see that the mirror is not perfect, but what do you expect for a vintage mirror that has been well loved. Side View. In case you are wondering the paint color of the walls is Meander Blue from Sherwin Williams. I really like this color of blue, it has just the right amount of green in it to blend with the rest of the turquoise in my house. Do you LOVE my Anthropologie shower curtain?!?! I LOVE it. Definitely a splurge put really adds to the room in my opinion. Side note: I am so excited that we will be getting our own Antro some time in the next year right here in Grand Rapids. I have been a once a year in store Anthro shopper for quite a while while I am in Salt Lake City for the Stampin' Up! convention. Now I'll be able to shop there all the time. Yikes, my hubby is going to pass out. 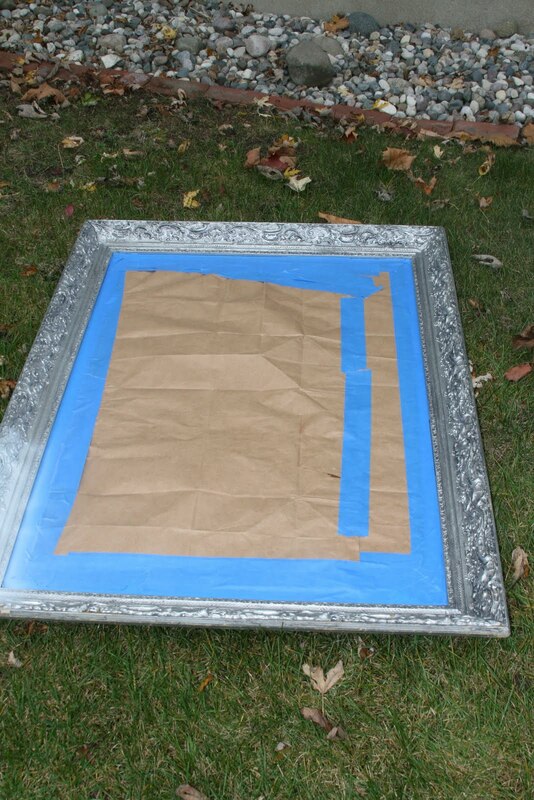 Cost for this project: $35 for the mirror from a resale shop, $10 in spray paint. 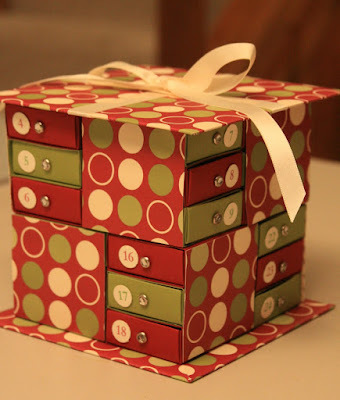 Come and make this quick and easy DVD Tin Scrapbook. These make great Christmas gifts for Parents, Teachers, Grand Parents, basically anyone that you need a small gift for! You will be able to chose from various papers and embellishments. Please RSVP by Friday November 26th. In order to save your seat please either comment here or e-mail me at taraangus@gmail.com and further details will be sent to you. Well, Halloween is over so it's time to change my buffet! It is still really bare but I wanted to show you my latest project today. 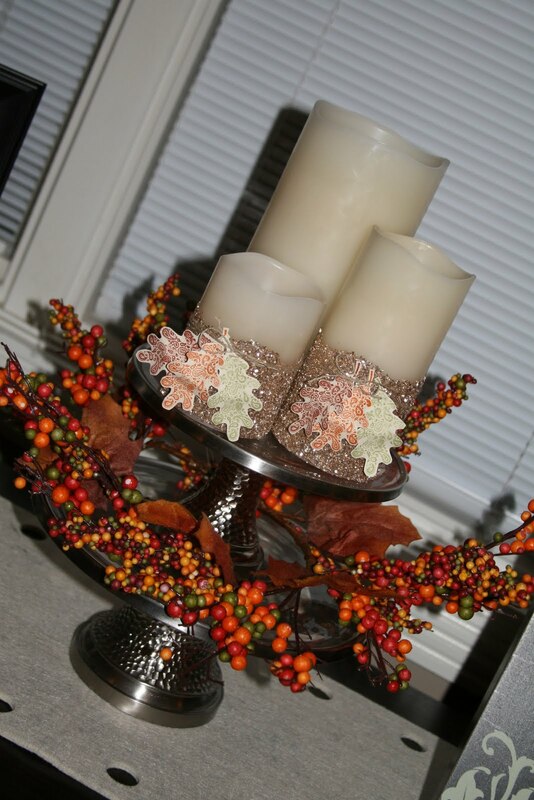 I first saw this great idea for fall glittered candles in Stampin' Up! 's Holiday mini catalog. LOVE the glass glitter! Stampin' Up! 's glass glitter comes in Champagne (that is the color I'm using today) or Silver. 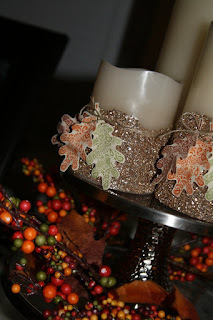 Using a foam paintbrush I spread a thin layer of Crystal Effects (sold by Stampin' Up!) onto the candle. I then sprinkled the glass glitter onto the candle all the way around, then came back and pushed the glitter into the glue with my finger, just to make sure. I then let it dry overnight. Next, using the Paisley Prints stamp set that is in the Holiday Mini Catalog I stamped a total of six leaves, two of each color. The ink colors that I used were, Pear Pizzaz, Pumpkin Pie, and Cajan Craze. After stamping I cut out the leaves and punched a hole at the base of the stem. Next I strung the leaves on Linen Thread, wrapped the thread around the candle, and finished with a small bow. Love that glitter and Love how this project turned out! Oh, I almost forgot the candles I am using are wax LED, since I have a two year old in the house I just find these safer for my family. Also, I'm not sure what would happen to the glitter with the heat of a "real" candle. So that is why I recommend if you want a burning look candle that you use a nice looking LED one. Interested in any of the products shown in my blog? 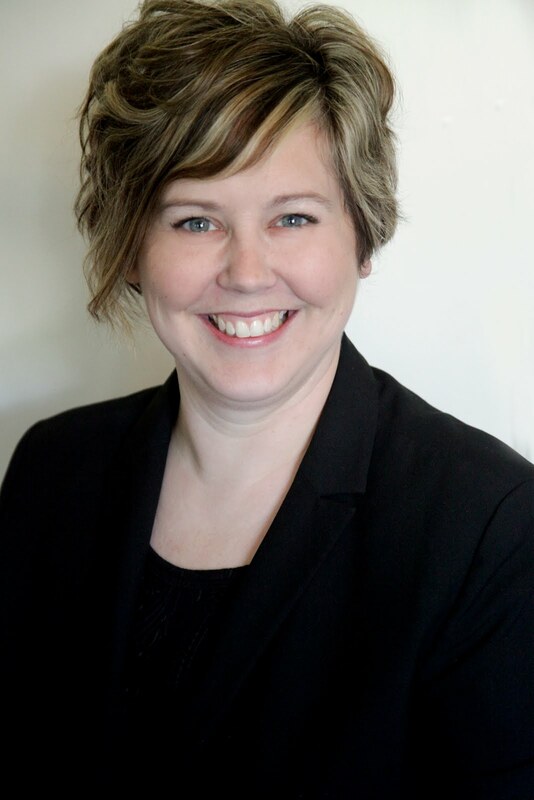 Would you like to learn more about my team? I am a professional counselor by day, a paper crafter, and artist by night. I love to teach others about their creativity and how to put it to good use.